Summer home cooling bills breaking the bank? Plant a tree to add shade & reduce costs! Try our step-by-step tips & tricks to grow your own asparagus at home! The biggest mistake you’ll make as a gardener is waiting to plant certain things. Yeah, there’s a lot to be said for giving yourself time to experience a space before you go crazy putting in an entire garden, but if there’s one thing you want to get into the ground as early as possible, it’s asparagus. Why plant it on the hurry-up? 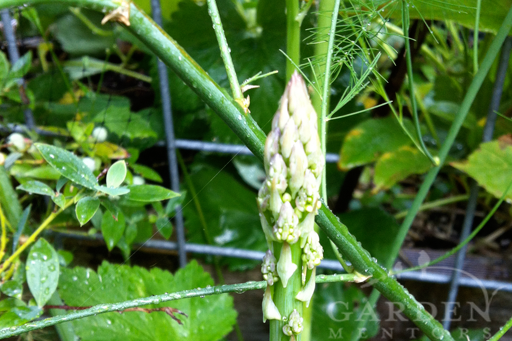 As with many perennial crops, asparagus needs at least two to three years to become established in the garden before you harvest a single spear. Sounds frustrating, but once this long-lived crop hits its stride, it will feed you an abundance of tasty, nutritious spears. Plus, these plants are incredibly beautiful, so encouraging them to grow beyond the edible spear stage will reward you with gorgeous, tall, ferny foliage spring through fall. It is possible to start your asparagus crop from seed, but that will just set you back even more years before harvest. 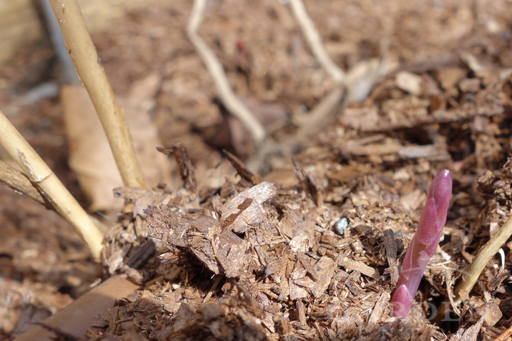 Instead, check your local nurseries during the late winter/early spring bare root season. This is when “crowns” are available. By about the end of March, these crowns tend to disappear for the season, so timing is everything. (If your nursery doesn’t carry asparagus crowns, check with a food seed cataloger. Many will ship asparagus in late winter too.) Look for varieties of asparagus known to perform in your area, are disease resistant, and are cultivated to spend very little energy on flowering and fruiting, which reduces the edible vegetative production work you really want. Select a location where the plants will get several hours of sunlight during the growing season. If you live in a notoriously soggy area, try to select a location that is well-drained. Although asparagus likes moisture, its octopus-tentacle-like roots can rot in too-sloppy soil. 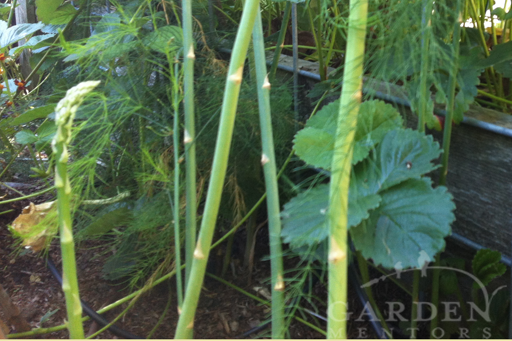 Also, remember that asparagus will grow up to five feet tall, so consider how it might cast shade over other plants. And, plan for your asparagus crop to travel throughout the bed in which you plant it. In other words: give it room to spread, and you’ll be rewarded with lots of shoots for years and years. This crop can go wild! Consider adding bareroot strawberries into the same bed. Theses two long-lived edibles perform nicely together and they look pretty too. 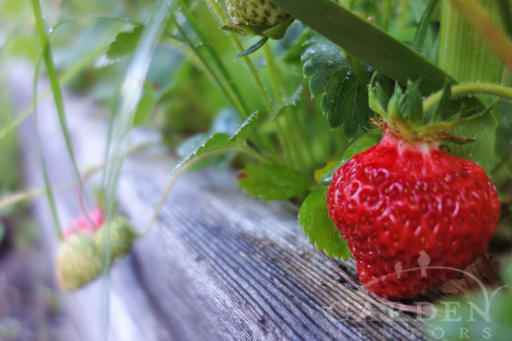 Strawberries and asparagus grow well together in the garden. If your asparagus crowns are really dry, pre-soaking them for several hours before planting can be helpful. Just don’t leave them to soak for days and days or the crowns will rot. When you’re ready to put them in the ground, dig a trench several inches deeper than your crown’s roots are long, and make each trench about as wide as the roots are long. This way, you can settle the crown’s roots both wide and deep into the soil. In other words, leave a few hanging deep and spread several wide in the trench. Refill the trench with the same garden soil, burying the top of the crown (the nub) just a few inches below the soil’s surface. Top dress with a generous helping of quality, composted mulch. And water thoroughly. And, when you’re about to give up and assume that nothing will ever come up, you’ll probably spy one or two tiny, soil-colored sprouts emerge from the soil. Then, don’t cut them. And, patiently wait for more shoots to emerge. As they do, fertilize through the growing season with Nitrogen-rich amendments like a touch of blood meal or a bit of alfalfa meal or some fish emulsion. 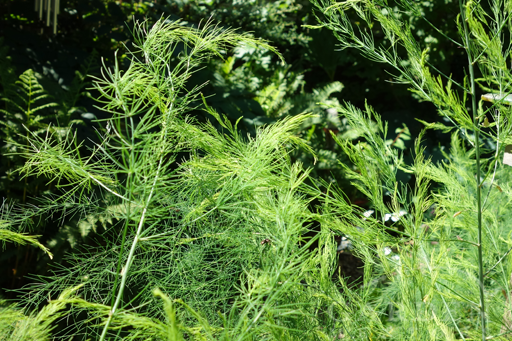 Asparagus foliage adds beautiful, tall texture to the mixed garden bed in summer. Eventually, your bed will be filled with tall, ferny green foliage. And, by late summer, a late crop of shoots may begin to shoot up among the ferny growth that formed from the early spring shoots. Don’t cut those late new shoots either that first (or second) year. By late autumn, the green ferny growth will turn golden yellow. Cut this back and compost it. 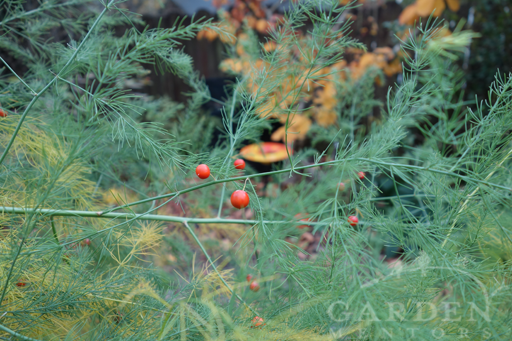 Leaving it to overwinter may act as a lure to over-winter asparagus beetle pests. Pray that your asparagus patch comes back. Watch the soil carefully in early spring for new shoots. Maybe buy a few crowns at a bareroot sale just in case your patch croaked over the winter. Plant them anywhere you’re certain you lost a crop — maybe the part of the patch where nothing came up in the prior year. Then, in spring, rejoice when those tiny shoots begin to emerge. But, don’t cut them. Enjoy another year of beautiful ferny foliage. 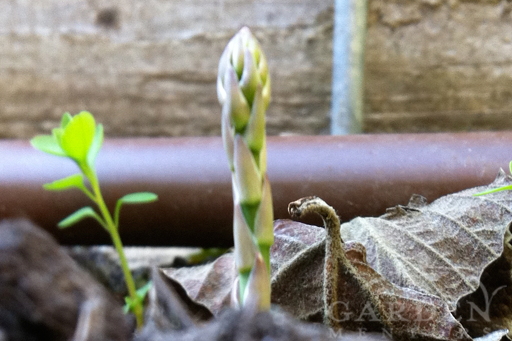 Check your asparagus bed daily ’cause you know you’re cutting some shoots this spring! When the first shoots come up, use a sharp paring knife to cut a few shoots out to eat after they’ve grown about four to eight inches above the soil level. Resist the urge to let the shoots grow much taller or they’ll get really fibrous. And, nobody wants to chew on woody asparagus. Also, resist the urge to cut every shoot you see. 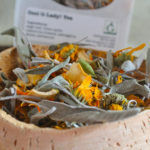 Leaving some will enable the plants to feed themselves and keep your crop growing in the years ahead. By about the end of spring, stop cutting shoots altogether and let anything else that forms grow tall. This will power up the plants for the year ahead. And, besides, you’re probably sick of asparagus by now anyway and your zucchini should be much more attractive to your seasonal, summer menus. Monitor your plants for asparagus beetle, which look a little like elongated lady beetles with touches of yellow and strips of red and black. And, keep that soil well-drained to keep root rot and other diseases at bay. Going forward, your treat your plants like in year three. Harvest some in the early season. Watch for pests and disease. And, if any areas appear to die-out (for non-disease reasons) replant during bareroot season. Add fertilization only as needed. If you made it this far, lucky you! Your asparagus patch can live for decades, so enjoy! Joan, thanks for sharing your story. We’re not sure what you’re asking us to help with. If you can clarify, maybe we can help.